Ceiling bath or bed hoist is a mechanical piece of equipment used for transferring disabled or elderly people from one place to another. Manual lifting of patients may cause back strain to the care givers. Mechanical products such as ceiling bath or bed hoists provide ease and comfort to the patient and to the nursing staff. What are the benefits of having a Bath Hoist? Before mobile hoists were introduced, assisting patients to finish various daily tasks was challenging for the nurses or care providers. With the help of the bath hoist, disabled or elderly people can experience a more comfortable and convenient life. Time saving – Easier movement and better mobility for patients. Bath hoists are portable lifters that help patients get in and out of the bath. You can adjust the sling of the bath hoist for a more comfortable lift. Reduces the risk of injuries – Minimises the chances and risks of causing patients and elderly people orthopaedic injuries in the process of transferring and lifting. Bed hoists have easy to move rails which are used to transfer heavy patients. Cost effective – As a great help to the caring staff, bed hoists have low maintenance cost due to its simple design. 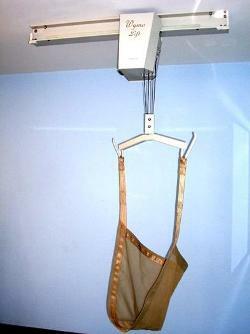 Bed hoists also take up less space in your room since it operates on a ceiling track. Why choose a C-Mac’s Bath Hoist? C-Mac is a leading manufacturer of high-quality and advanced mechanical products in Australia. We have been committed to designing and manufacturing innovative and quality mechanical products like bath hoists for our customers over many years. C-Mac can customise products to fulfil the needs of our different customers. This product was designed and prototyped at C-Mac Industries and manufactured in-house. Only ceiling hoist is Made in Australia. C-Mac is seeking a company that is experienced in the Aged Care or Health Industry to distribute & sell bath hoists. Must have links to Government and NGO Access Programs.